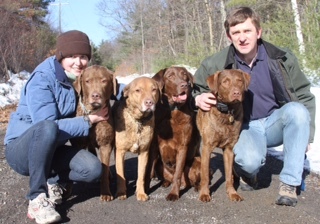 We rescule and place needy Chesapeake Bay Retrievers of all ages. Meet Roger and Gibby! We are a father-daughter team who have been involved with CSH while it was under the guidance of founder Jane Peabody for over fifteen years. When Jane was looking to retire we felt strongly about keeping the wonderful work of CSH going. As a result we moved the rescue to our home in western Massachusetts.